Electrolux, together with the startup Karma, introduces a smart refrigerator for grocery stores. The refrigerator will be integrated with Karma’s app and will contribute to the reduction of food waste by making it easier for supermarkets to sell food not bought before the end of the working day to consumers. In August 2018, Electrolux announced that it is investing in the Sweden-born startup Karma. At the same time, the two companies initiated a strategic partnership, exploring innovative solutions for the future of food and jointly helping consumers and the food industry take bigger responsibility in reducing food waste. The partnership combines Electrolux’s expertise on food preservation with Karma’s technology and knowledge of food waste. The refrigerator efficiently creates storage and a pickup point for unsold food that otherwise would likely be thrown away, as well as enabling grocery stores that don’t have a natural pickup location to use Karma. The refrigerator is introduced as a beta version, and is available at the grocery store ICA Kvantum Liljeholmen in Stockholm, Sweden until December 31st, 2018. 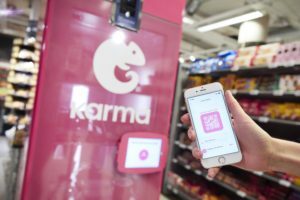 Here’s how it works: a Karma user that makes a purchase at the ICA Kvantum Liljeholmen store in Stockholm through the Karma app can collect the ordered product directly from the connected refrigerator. The user unlocks the connected refrigerator, which is equipped with a smart lock, by displaying a QR code. The purchased product needs to then be shown by the user at the checkout in the grocery store.